Holy Bat symbols! Why make an entire mystery set just for one character!? Because he’s Batman! That’s right, the 2016 Funko Vintage Collection Batman Mystery Minis release is solely dedicated to the colorful comic book past of the Caped Crusader. The miniature set is issued exclusively through GameStop. Bruce Wayne is known by many names other than Batman: The Dark Knight, The World’s Greatest Detective, Bats, The Bat, The Batman, Caped Crusader, and my personal favorite used by Joker, Batsy. Not surprisingly, The Batman has also donned numerous versions of the Batsuit. With that in mind, Funko’s stylized likenesses have given collectors plenty of variety to choose from and Funko Vintage Collection Batman Mystery Minis figures continue the colorful tradition. Sold in a blind-box format and packed by the case, the miniature figure's various colorways include Batman in blue, brown, green, orange, pink, and purple attire, as well as white with a black mask, and a zebra Batsuit. 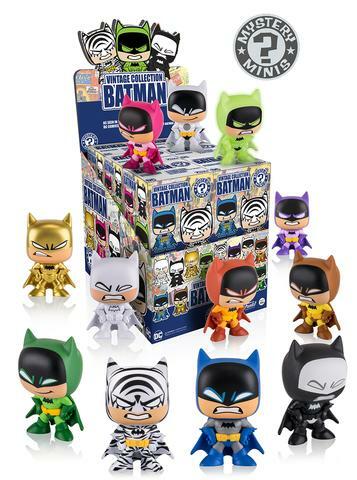 Other choices in the Funko Vintage Collection Batman Mystery Minis line resemble the Target-exclusive Pop! figures: Golden Midas, Negative, glow-in-the-dark Professor Radium, and North Pole Camo Batman. Standing approximately 2 1/2" tall, all of the options in the Funko Vintage Collection Batman Mystery Minis set carry 1:12 odds. With 12 figures to collect and a dozen figures per case, completists have a greater chance of finding them all with one case. FUNKO DC MYSTERY MINI GAMESTOP EXCLUSIVE VINTAGE PURPLE BATMAN VINYL FIGURE 2.5"
FUNKO DC MYSTERY MINI GAMESTOP EXCLUSIVE VINTAGE YELLOW BATMAN VINYL FIGURE 2.5"
Do we know how rare the gold ones are? All have the same odds: 1:12 boxes. Oh ok, I thought while looking at some with my son, the case that the boxes sit in, said something about the gold ones being more rare. Thanks Trey!